There are instances where a PVD is incomplete, leaving the vitreous partially attached to the retina, and causing traction (pulling) that can cause anatomic damage. 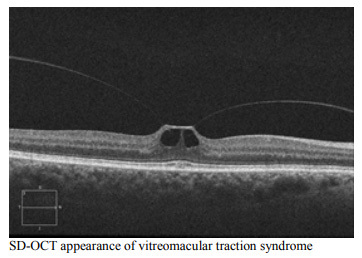 This is called vitreomacular traction syndrome (VMT). Photopsia – When a person sees flashes of light in the eye. Micropsia – When objects appear smaller than their actual size. Metamorphopsia – When vision is distorted to make a grid of straight lines appear wavy or blank. Some of these symptoms can be mild and develop slowly; however, chronic tractional effects can lead to continued vision loss if left untreated. In some cases, a distortion of a visual picture is noticed without necessarily having a reduction in sharpness of vision. Diagnosing VMT syndrome can be done through the use of picture-taking equipment by your retina specialist. Optical coherence tomography (OCT) and B-mode ultrasonography (B-scan) are two of the best ways to evaluate the degree by which the VMT forces are distorting the retinal structure and to evaluate the vitreoretinal interface. Taking a watchful waiting approach by regular monitoring with follow-up examinations and serial OCT imaging is one method for treatment of VMT, as these can spontaneously resolve in some cases. 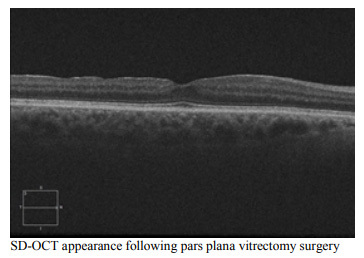 On the other hand, for patients whose symptoms are severe enough to require surgical intervention, undergoing pars plana vitrectomy surgery is another option. This technique involves manual release of vitreous attachment and alleviation of traction done in the operating room on an outpatient basis. This intervention is more invasive, therefore being reserved for patients who are at risk for severe visual disturbances and/or central blindness. SD-OCT appearance of vitreomacular traction syndrome SD-OCT appearance following pars plana vitrectomy surgery Most patients with VMT syndrome maintain good visual acuity in the affected eye, even if treatment is not required; although studies have shown that shorter duration of symptoms results in better prognosis when surgical treatment is employed.